Review: It’s clear that Billy Bob Thornton is more successful in front of the camera than behind it. 1996’s “Sling Blade” is an exception to this fact, where he was brilliant on both sides. 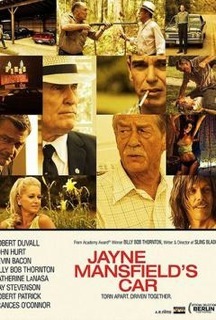 After 11 years without directing, he is back with “Jayne Mansfield’s Car”, a film with respected intentions despite of a somewhat messy plot. A woman’s funeral will join two families together in Alabama, one American and one English. Curiously, both of them have common problems that drag on for some time. Billy Bob creates its own vision on father-son relationships in addition to war traumas, but I believe this could have been done without a forced plot and using a less restrained execution. Most of the scenes didn't take advantage from the underlying tension created. It was a shame that the movie hadn’t totally assumed the weirdness suggested in some moments, opting instead for a more formulaic approach. Positive aspects: the performances, and Robert Duvall's magnificent trip on LSD. Recommended with reservations.